I firmly believe that we can learn from both our Successes and our Mistakes. We must always keep moving forward. If you stop you will be over run by the Sheeple. You must also remember who Murphy is and all of his laws. Rule #17: Always Be Careful Who You Loan Your Tools To." I was up and at the break of dawn and after a quick Breakfast I began to unload the tiller down at the garden site. Just as I got it out of the PU bed my neighbor to the East drives up to the fence in his ATV and a can of beer. He is another Ole Timer not quite WW II vintage but old enough for me to show him some respect. He asked about the fire several weeks past and we chat a little before I allow as how I need to get to work tilling this garden and that this was the first time I ever used a tiller. He right away tells me how last weekend he did his garden with a tiller just like the one I had rented and allowed as how it only took several hours. He also told me that it "worked a whole lot better once he took off the wheels". I looked over the tiller and sure enough the wheels were removable but I was not too sure about this plan to remove them. He then climbs over the fence and says "let me give you a hand and show you how it works". We fiddle with it for a while and finally get the wheels off. He then says "I'll show you how it works then you can give it a Shot". Again, he was an Ole Timer and just might know a thing or two, Sooo I let him have at it. I had already test started it so I gave it a jerk, It started, He grabbed hold of the handle bars revved the engine and engaged the tines. That was when Murphy joined in the game - The tiller took three giant leaps and a couple of smaller ones before it reached the fence with the Ole Timer still hanging on for dear life. Before I could get to him and cut it off it had chewed into the tines about a 10' section of goat wire and barbed wire. When things finally stopped he said "Dammit that was a hell of a ride, this must be more powerful than the one I used" He then calmly walked through the hole in the fence, got on his ATV and disappeared over the rise toward his barn. I was left with a "Bird Nest" from hell that I am sure that Murphy was real proud of. The only tool I had with me that would cut wire was a pair if Lineman Pliers. I got them out of the truck and began to cut the tiller out of the fence. 30 -40 minutes later just as I pulled the tiller loose from the last piece of wire still attached to the fence, here comes my neighbor with a spool of barbed wire and a section of Goat wire. He hopped off his ATV and says "Mind giving a hand patching this here gap". (Sure - Why Not). It took until lunch to get the "Gap Patched". He then climbed over the fence and was last seen going over the rise toward his barn. It was several months before we spoke again and no mention was made of the tiller incident. I guessed that was the way of things in the country. I still had the Bird Nest from hell to deal with. It took me the rest of the day and most of Sunday to get the tiller squared away. The most difficult part was making the 2' tang on the rear straight again. I even washed the tiller before I took it back to town looking no worse for the fence war. Again, I hope that we learned another of Murphy's Rules and that ya'll were able to see the error of my ways. (I certainly did) See ya'll again on "Mistakes Part 4". Thought ya'll might like to know what is happening to the media in our Capital city. It appears that the CBS station KEYE has laid off a number of folks this week, 14-Admin & Sales folks were quietly let go earlier this week and 4-On camera folks were let go yesterday. Looks like no one is immune as the cuts begin. One feature of the official government preps for Gustav that I've already noticed is the tendency for government to get ahead of itself/overreact. New Orleans was preparing to evacuate as of last night, our local university (Lamar U.) is holding its emergency planning meetings as we speak, and our local government here is already abuzz. This storm has not even entered the Gulf yet. The official weather predictions and forecasts change several times a day. Yesterday (Wednesday), Southeast Texas was the far eastern edge of the 5-day warning cone. Now, they are saying we are more securely in the bullseye. What does all of this mean? The govt. agencies can't risk acting too late or not at all, so they tend to overreact, such as evacuating the Houston area before Rita. By being wrong on that order, they risk having many residents ignore the next one. I suppose that overdoing it is better than doing nothing. But it does lend itself to crying wolf. Either way, I feel better when I take my own precautions and rely on my judgment. The cars are gassed up, family has been notified, and if, need be, we leave the area; we know where we are going. And if, like during Rita, our initial evacuation spot turns out to be a bad idea, we have a backup plan, and then a backup backup plan. Even though Gustav will apparently not make landfall until Tuesday Am, wherever it lands, I'll keep a watchful eye on it all weekend. Thanks for this valuable update! For many of you out there you may have seen the large number of buses being assembled in San Antonio in case of emergency evacuations becoming necessary. What the news doesn't say is that a number of officers from the SAPD have been assigned to work extra shifts during these preparations for emergency evacuations to handle security. Some tips from down here - those big a$$ nails (60d - 6"+ length) are well worth carrying in the field. I've used them as fire irons, using them to support a small cup of water for cup-of-soup. Driven into ground, they allow a small skillet to be supported over the fire. Driven lengthwise through the long end of a potato, they cook the inside of a potato more efficiently when cooking over a fire, heating inside and outside simultaneously. No more raw interior / roasted exterior. They make even larger 8" - 9" as well, but all I've seen are galvanized - believe they are classified as spikes. Here’s a good link to them, as well as working weight usage. J.R. Guerra in south TX. Mesquite, the most common shrub or small tree in the Desert Southwest, forms fruit of bean-like pods in the fall that have long been a nutritious food source to humans, wildlife and livestock. Sap - as a snack, glue and dye. We got lucky this time! A plan to attack one of our schools was stopped just in time before it became another of a long list of school tragedies. I firmly believe that we can learn from both our Successes and our Mistakes. We can do almost any thing we set our hearts on as long as we remember who Murphy is and all of his laws. Rule #1: "If it can go wrong - It will." The year after the "Orchard" disaster I was picking up rocks in the planned "Garden Area" closer to the well head about half way between the planned home site and S of the failed orchard. I had already built a small cabin just a little further S of the Home site to make the weekend stays a little more comfortable. It was a clear sunny day with no wind, just a bright spring day that makes you want to enjoy the world around you. The "Garden Plan" was another 50' x100' plot that called for 12-4'wide by 40' long raised beds with 4' walkways between them. I wanted to use the "French Intensive" method but the top soil is limited in this area so "Raised Beds" got the nod. My thoughts at the time were "Why try to till through all this grass (about 1'-2' tall)"? "All I have to do is burn it off and then the tilling will be sooo much easier" That sounded like a good plan and I started a small fire that would be easy to control until the entire Garden Area was cleared, (Right!) - Besides the ash from the burned grass and weeds would be good for the soil. Unknown to me, Murphy had taken up residence beneath my cabin. As you might have guessed by now - That small fire quickly became one that I could no longer control and headed straight through the planned home site, past the well head toward the cabin. Before I could get the water hose into action the fire had sped past the cabin and onto my neighbors acreage to the S of mine. Luckily, I had purchased a cheap 3hp mower and had been mowing around the cabin and well head for the last few months otherwise I might have lost both to the by now raging grass fire. My neighbor just happened to be home and placed a call to the local VFD then came out to help me fight the now losing battle with the fire that was now burning his storage building. Neither his hoses nor mine were able to reach the battle. After about 10-15 minutes the VFD arrived and quickly put out the blaze. Too make a long story short - About 20 acres belonging to my neighbor went up in flames as did the small storage building that also belonged to him. I got to know him real well that day. I also got to know most of the members of the VFD as well. Cost: A new 8' x 10' storage building for my neighbor and a few yard tools as well. A healthy donation to the local VFD. A new respect for the bringer of all things not good - Murphy! Again, I hope this was not too long and that ya'll were able to see the error of my ways. (I certainly did) See ya'll again on "Mistakes Part 3". Being informed is a key part of being prepared. An awareness of what is happening and where it is happening should be a vital part of everyone's plans. You should know different things about the area you live in so that you can be prepared if things stray away from normal patterns. Don't know which aquifer you get your water from? Have no idea what the average rainfall for your area of the state is? These are just a couple of the very important questions you should know the answer to without even thinking about it! I hope the members will find this information of benefit. Breaking News - Are you being shorted at the gas pump! Well it seems that not only high gas prices are sucking up our dollars, now we have to contend with gasoline outlets that are shorting Texas consumers at the pump. Worse yet is the fact that consumer complaints are up a whopping 500 % over last year. Make sure you check the pump or you won't need to check your wallet. "Search any ZIP code in the Houston area or the entire state of Texas and find gas pumps that state inspectors previously took out of service. You can also find details about what state inspectors found and see if you live or work near any of those pumps. " I firmly believe that we can learn from both our Successes and our Mistakes. I also believe that we learn more from our Mistakes than from our Successes, at least that has been my own personal experience. The Lord knows that we all make many, many Mistakes as we grow in life. Sooo, with that in mind, I propose to share with ya'll some of the worst Mistakes that I have made over the years and hopefully save some of you some grief that I have endured over the years. Years ago, when I first purchased this little piece of seclusion in the Hill Country, I decided that one of the things I could do to improve the overall productivity of the "Turf", would be to put in a Fruit Orchard. Having done some extensive research as to which types of fruit would grow best in this area I decided on several types of each fruit (Apples, Peaches, Pears, Plumbs and Figs ), would be needed for cross pollination, extended season and other reasons. I further decided that "Dwarf Fruit Trees" were the choice to make because they mature and produce fruit quicker, take less room to grow and are easier to harvest than standard trees. So far so good! I had selected an open are about 50' x 100' to be the "Orchard Area". By planting the trees on 10' centers (Recommended), I would be able to fit 40 fruit trees into that area. With the "Plot Plan" made up I was ready to go. Spring Vacation was coming up and the local garden supply had their stock on sale and now was the time to get started. I purchased 40 trees, 8 of each type of fruit at $9.95 each for just over $400.00. (Sounds cheap but this was 1973) I hate to think of what this project would cost today. Vacation week came and went. Trees got planted with time to spare and that was a good thing as I now realized my first small Mistake. The Orchard Area was 420' from the well head to the front edge of the Orchard. I had only 100' of garden hose… Spent the rest of the week hauling water in 5 gallon buckets to set the trees in good and proper. I was not living on the "Turf" yet - Just coming out and spending the weekends cutting brush, picking up rocks, putting in perimeter fencing and now hauling more and more water for the trees as the weather got warmer. By the end of May I was the proud owner of 600' of cheap garden hose. By the middle of June the Fruit Trees were looking great not a single tree lost with all looking fresh, green and lush and I was feeling pretty smug about this project and the outcome. Now came the 4th of July weekend. As I arrived the first thing I noticed was that there were no leaves at all on the Fruit Trees. What could have happened - The soil was still damp - Yet NO LEAVES! By this time I had met my neighbor (WWII Vet) who lived on the 200 acres just to the north of me. I asked him about my situation. His response was just one word - DEER! He also advised that if I kept on watering them they would probably come around by Fall. I followed his advice and sure enough they came back to life. The next year the same thing happened - Looking great one weekend the next weekend NO LEAVES! AAARRGGHH! Another Mistake! By now I had done more research and discovered the need for some elaborate fencing to keep the deer at bay. I then made the decision to postpone the Orchard Project until I had moved to the Turf. I hope this was not too long and that ya'll were able to see the error of my ways. See ya'll again on "Mistake II. Lehman Brothers Bank is probably the bank that will go down. Freddie Mac and Fannie Mae are going also. I could care less. Let's just get the mess out on the floor and get it swept up. "Professor Kenneth Rogoff, a leading academic economist, said there was yet worse news to come from the worldwide credit crunch and financial turmoil, particularly in the United States, and that a high-profile casualty among American banks was highly likely. " This is a subject that receives little media attention, but it is a real problem looming on the horizon. The Texas Parks and Wildlife Department lists this as one of the biggest issues they have to contend with. For some reason, most folks don't remember the drought of the late 80s and early to mid 90s. Things got pretty critical back then, and drastic measures had to be taken. Things were so bad that hay had to be trucked in from Kansas and other states to feed livestock. Round bales that normally go for 35 bucks were selling for $200 or more. Lake Corpus Christi was down to 30%. The situation was pretty bleak. Fortunately, Hurricane Gilbert came along in 1989 and filled the lakes back up while giving south and central Texas a desperately needed soaking. But the help was short lived as continued drought conditions took their toll. Lakes again dropped to dangerously low levels, and water conservation was the battle cry. We've been in a pretty wet cycle for quite a few years now, and many folks seem to have forgotten the drought years. Folks water their manicured lawns with reckless abandon. Water is wasted everywhere you look. But as populations continue to steadily grow, more and more pressure is placed on our water resources, with no end in sight. Industry in particular is consuming water at an ever increasing rate. The power plant I used to work at consumes about one million gallons per day, sometimes more. As more and more industrial users come on line, the situation only gets worse. Couple that with unchecked illegal immigration, and folks relocating to Texas in huge numbers, and we've got major problems on our hands. Besides rivers, the Edwards Aquifer is the major water supply for a large portion of the state. The San Antonio metropolitan area, and surrounding cities are the major consumers of this resource. They are bleeding the aquifer dry. Natural springs in the hill country that are fed by the aquifer are flowing at ever decreasing rates due to the consumption of the big cities and industry. This doesn't look good for the continuation of "life as we know it". Water is becoming scarce in Texas, and it will only take a few years of drought like we had 15 years ago to send everyone into a panic. We as preppers can help mitigate this impending disaster by doing everything we can to reduce our water consumption, and by utilizing all available water to our best advantage. Things like rain water collecting, grey water recycling, and responsible use of water will go a long way towards preserving this precious resource. Try to pass on responsible use of water to your friends and family. And always remember that leading by example is the best teaching method there is. Water is precious, don't waste it! 1.) Got a problem with those pesky little barn swallows nesting on the front or back of your porches causing SHTF (Stuff Hitting The Floor)? Simply put a bead of lemon-scented dishwashing liquid (Joy, etc.) along the edge where they are trying to build a nest and they will go somewhere else. Caution: Barn swallows are a federally protected species and you’re not supposed to interfere with their nests once they’re started. 2.) Got a problem with slugs or snails in your garden? Sprinkle the area around your plants with either coffee grounds or crushed egg shells. This creates an abrasive barrier that they won’t cross. 3.) Got a problem with the deer munching on your plants? Take your deodorant soap scraps; place them in a piece of old hosiery (Do Not use the wife’s good ones!) and hang in and around your garden and your plants. The fragrance from the deodorant soap will discourage their appetite for your goodies! These are just a few tips you might find useful. Got a tip of your own on how to handle pesky critters? Leave a comment and make yourself famous! Belwether Bill has provided a new link for information on terrorism alerts for the membership. Bill believes this information will be of value to everyone. This link will also be available in the side bar also under News Alerts for future reference. The Texas Prepper's Network would like to welcome Belwether Bill to the network. Bill is located in the NW part of Central Texas and looks forward to sharing ideas and information with fellow preppers in Texas. Bill will be helping us keep up to date on happenings in his area of the state. Welcome to the network! Many new gardeners experience a number of problems when they first attempt a garden on their own. They suffer a myriad of problems that may not be their fault. It’s sometimes as simple as planting the right combination of vegetables in the right place. This is known as companion gardening. Many people are aware of the “Three Sisters” technique when planting a garden. Fortunately for gardeners there are a number of other combinations that will help you grow a better and healthier garden without the use of pesticides and herbicides. Organic gardeners frequently use these techniques. Some combinations will help to eliminate pests from your garden plants or attract beneficial insects to help it grow better. Some combinations will help to enhance the growth and flavor of your produce. Other combinations can have detrimental effects on your garden as well and need to be avoided. A prime example of this is the combination of dill and carrots. When planted in close proximity to each other dill will stunt the growth of your carrots and cause a significant reduction in your yield. Be sure to check out The Value of a Garden and Do You Want the Crash at The Survival Podcast . Choosing a Site for Your Water Well! Millions of people enjoy the benefits of having their own water wells from which they get their water for drinking, sanitation, irrigation and other uses. One of the first considerations for people who have recently acquired land for a retreat or bug-out is the establishment of a good source of water; one of their primary options is drilling a water well. If you decide to drill your own or have one drilled for you, you will need to choose a proper site so that your water will stay clean and pure. 3.) Any possible hazards to your water supply (herbicides and/or pesticides in use in the area and bacterial contamination from flooding in the area). 4.) Easy access to the well and the well site site (for repairs, maintenance, etc.). Normally contaminants are filtered out as water seeps back into the ground and returns to the aquifer where water is stored in the earth. A good well site should be several hundred yards from any possible contamination. Avoid feedlots, animal pens, dumping grounds, etc. due to the possibility of contamination. It is also best to avoid low spots where heavy rains or flooding could allow surface water levels to rise above the well head and cause further contamination of your water well. It’s always a good practice to check with your neighbors in the area who already have water wells and who can give you advice on drilling your water well. You can also consult the “local” telephone directory to find a qualified water well drilling contractor. Be sure to check all local, regional, and state rules and regulations concerning water wells before you drill a well to make sure you will be in complince wtih any laws. Wellowner.org is a top resource for information on private water well systems and ground water. Be sure and check out some of the new videos on their site. This information comes from Mark P. (aka Pickdog) and has asked that the membership be informed of this breaking financial news. The Global Positioning System, or GPS, is a very handy thing. One piece of modern technology that really is beneficial to everyone. "But if TSHTF, it won't be around anymore" you say. Or will it? The Global Positioning System is comprised of a bunch of satellites that are in geosynchronous orbit, that is, they're revolving with the Earth, not around it. Meaning that they're always in the same general spot above the Earth, 24/7/365. These satellites are solar powered, and generally autonomous in their operation, meaning that they can hang up there and do what they do, with very little, or no input from the ground, for quite some time. I believe GPS will still be viable for years, maybe even decades after a TEOTWAWKI event. It depends on the lifespan of the satellites. That being said, GPS ain't the be all end all, and should not be relied upon as your sole method of navigation! Good conventional navigation skills are still essential if you plan on doing any wandering about, by land or by sea. For the unindoctrinated, GPS receivers (the thing you go buy) work by triangulating (at least) your position via the signals it receives from those satellites up there. Most times your receiver will get signals from more than 3 satellites, and this is good because accuracy is increased with more satellite "fixes". Of course, Big Brother can mess with your world, and has in the past, by introducing an error into the system. The error is not huge, measured in yards, but it can be there. The good ol' free market got around that error by introducing DGPS, or "differential", which corrected the government induced error. And today we have the latest and greatest, the Wide Area Augmentation System, or WAAS. WAAS incorporates ground stations and increases accuracy up to 5 times over standard GPS. Most new receivers you can purchase today are WAAS capable. A simple hand held GPS unit is a good thing to have around, especially if you must travel the back roads when bugging out, or worse, if you're left on foot. As stated earlier, you shouldn't depend entirely on GPS, but it is a valuable tool to add to your gear. Nowadays they're pretty cheap too, you can get a Garmin hand held for less than 150 bucks. Having a second navigation tool is essential, especially if you become lost or disoriented. There have been cases where folks have become disoriented, and didn't believe what their compass was telling them, so having GPS to augment your compass is a good idea. It's hard to argue with what TWO devices are tellin' you! BUT (there's always a but, ain't there? ), if the GPS is telling you one thing, and the compass another.... Go with the compass! North is north, and that's all a compass does is point north. Unless your standing next to a huge magnet or something..... But as I said, Big Brother can manipulate GPS. As far as I know, he hasn't found a way to manipulate polar north yet! GPS can also be effected by other things, like ionospheric disturbances, solar flares, satellite orbit errors, etc. So treat it with a healthy dose of skepticism if you think it's telling you wrong, and double check it against a compass, maps, or whatever else you might have on hand. Your brain is your best navigation tool, but GPS sure can take a load off of it and free you up to do other things. So long as there are still 3 GPS satellites in operation overhead, and you have solar rechargeable batteries, GPS will remain a very valuable navigation tool. I've been using it on boats regularly since 1996, and I don't leave shore without it! FEMA - Are They Limiting the Rights of Landowners? Still thinking about buying land for a retreat area, perhaps you may want to think twice and get all the necessary information on that property. It seems that FEMA’s Flood Mitigation Assistance Program is throwing up roadblocks to local officials in the State of Texas and severely limiting the property rights of land owners in the state. Better make sure you can actually use the property before you make a purchase. A new link has been provided in the sidebar for online versions of newspapers for different areas of the State of Texas. Hopefully this will be of benefit to the membership. Thanks. The Texas Prepper's Network would like to welcome SMO to the network. SMO is South of Dallas and looks forward to helping out by sharing ideas and information. SMO will also be helping us keep up to date on local events in his area. Welcome aboard! The Texas Prepper's Network would like to welcome Cindy & Jim in Austin to the network. Cindy & Jim look forward to sharing ideas and information with everyone. They will be working to keep us up to date on things in the Austin area. Welcome aboard! 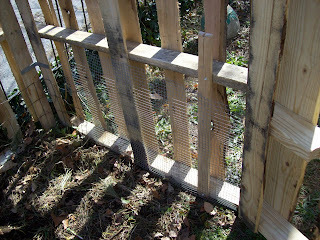 Ok, you will need to get 4 pallets to make your compost bin. I made my bin for under $5 bucks. Go to depot and get some 4 sturdy L brackets, 2 Strap hinges, a latch system and gate handle for the door. I sure hope you all will be happy with the new Texas Prepper's Network. It looks like it could be a going thing. I just hope you all decide to do something in groups. There are just entirely too many of you to have anyone wandering around looking for a home. By this time next year I hope some of you will have purchased land for a retreat and have it going. You want water and natural protection and some tillable land for a garden. What ever you have when you buy the land, you will not have to have installed later on. Get out of the towns and cities and away from the maddening crowd. You probably have some time yet, so use it wisely and make good decisions. But get settled into being on the TPN. This is the first statewide network in the country and it can be an example for others to consider. Learn to coordinate your news. Learn to check prices and stuff like that. You might even be able to maximize your spending power if you buy as a group. Buying wholesale is a nice thing. I figure that if just a hundred of you got together and contributed $10 a week, by the time the end of October was here you would have $10,000 and be well on your way to getting some dirt to call your retreat. And if you don't have the money for the whole piece of the dirt, then get a contract for the agreed upon price and have it held until you can get it the full amount. You are wanting a deed here, not a mortgage. You want as much protection as possible to keep the land from being taken away. I have more to say about how to keep the land for the whole group but it is not time for that right now. So get accustomed to your new organization and to each other. The Network is a stepping stone toward true survivalism. Make every step count. And keep going! You're ahead of the crowd! Pickdog has a news article that contains a lot of information about the economic storm that is affecting everyone. Please take some time and read this exceptionally informative article. Pickdog's main area of expertise and interest is economics. Thanks Pickdog for this great find! Wow! I had no idea this thing would take off so fast! Welcome one and all. It looks like this is shaping up to be quite a network. We might even give Rawles a run for the money (ha ha)! Seriously, this is gonna be a really great place for preppers to go for information and ideas. With this many members in the first few days, just imagine how it might look in a few months! And on that note, if any of y'all have prepper friends, neighbors, or family members, invite them to join up as well. The more, the merrier! The Texas Prepper's Network would like to welcome Mark P. (aka Pickdog) to the network. Pickdog is in the Austin area and will work to keep us posted on local events in his area. He also looks forward to sharing ideas and information. Welcome aboard! The Texas Prepper's Network would like to welcome JR in the Valley to the network. JR will be keeping us up to date on things down in the Rio Grande Valley area and looks forward to sharing ideas and information with everyone. Welcome aboard! The Texas Prepper's Network would like to welcome bobby in Galveston to the network. Bobby is a serious prepper and looks forward to sharing ideas and information. Bobby will also help keep us up to date on local events in the Galveston area. Welcome aboard! The Texas Prepper's Network would like to welcome another new member to the network. Deborah is in the Texas hill country and looks forward to sharing ideas and information with everyone. Welcome aboard! Share Information With a Fellow Texan! Just like to invite anyone that has an idea or a tip that someone may find helpful to post a comment. If you would just like to share some information on a great web site you know about or anything else that may be useful, that would be great also. TPN would like to welcome Mike & Cindy in the Corpus Christi area to the Texas prepper's Network. They will be helping Mayberry in keeping us up to date on happenings in the Corpus Christi area. They look forward to sharing ideas and information with everyone out there. Welcome aboard! TPN would like to welcome Jimmy & Linda to the Texas Prepper's Network. Jimmy & Linda will be keeping us up to date on happenings in the Amarillo area. They both look forward to sharing ideas and information with everyone. Welcome aboard! Mayberry here! First off, I'd like to give RW a big thank you for getting this ball rolling. I think this network is a really great idea, and that it will go on to big things.... On that note, I'd like to put out what exactly it is we're doing here, and what exactly we're looking for. Our mission is to put together a network of Texas preppers from across the state. From this network, we hope to gather and present local/ regional news and information that all Texans, and preppers in general need to know. Plus, we'd like any prepping tips, ideas, and information you'd like to share as well. Many of us don't have time to put up a blog of our own, but maybe y'all have something you'd like to share. Well this is the place to do it! The first thing we need is members! Hey, that's what a network is all about, right? To sign up for membership, contact Riverwalker via the e-mail link on the right hand side of the blog. Of course, your personal information will be kept absolutely confidential. Once approved, new members will be given posting privileges, and will be free to post pertinent information from their local area. Things like road hazards or closures, shortages of items (food, batteries, etc...), storm or weather alerts, localized crime surges, zombie biker attacks (ha ha, just had to throw that one in there), or any other survival/ disaster information you might want to throw out there. Also, you could request information or submit your own survival tips and ideas. Essentially, this is an information network by and for Texas preppers/ survivalists, but all preppers are welcome! What we are not looking for here are editorials, rants, or op-ed pieces (I know, I know.... I'll behave myself, I promise!). We just want local/ regional news and information from the folks who live there. I think most folks are just a bit distrustful of the media nowadays, seeing as how they tend to over-sensationalize, and/ or omit important facts and information. This network will help fill that void. After all, your best news source is the folks who live in an area, and see things first hand. So join the network! Bring us your news and information, prepping/ survival tips, tricks, and toys, prep food recipes, or what have you! And as RW says; Be aware. Be informed. Be prepared. The Texas Prepper's Network would like to welcome Neal C. as a new member of the network. Neal C. is in the Fort Worth area and will be helping to keep us updated on local events in his area. Neal looks forward to sharing ideas and information with everyone. The main purpose of the Texas Prepper's Network is to help fellow Texans be better prepared. It doesn't matter if you only seek knowledge that will help you be better prepared or desire to pass on information to other Texans to help them be better prepared. The choice is entirely yours. Although we encourage your participation, we realize that with everyday demands on a person's time that this is not always possible. Being aware of local events that can affect our everyday lives, being informed about these events, and taking the necessary steps to be prepared for these events can be of benefit everyone. Texas is a big state. The ability for someone to be knowledgeable of local events in all areas of the state would be a truly immense task. It is hoped that a state-wide network will make this a more manageable task. Eventually we hope to have members in all regions of this great state of ours. Hopefully, people will be able to get localized information in any part of the state that they may be located in, plan to be located, or may only be traveling through a particular area of the state, whether their travel be business or pleasure. The Texas Prepper's Network would like to welcome luke_n_bmt to the network. Luke is not really new but has already contributed several items on local events in order to help people be better prepared. Luke is in the Beaumont - Port Athur area and will be keeping us up to date on local events in his area. The Texas Prepper's Network would like to welcome Mayberry to the network. He will be a valuable addition to the network. Mayberry is in the Corpus Christi area and will be keeping us up to date on local events in his area. The network is under construction.